The pumpkin bug has finally bit me. After seeing so many pumpkin recipes on all the blogs, and with the weather finally starting to cool down here, it has happened. It finally feels like fall is here. The pants and long sleeve shirts are coming to the front of the closet again, and I’m making sure I find my gloves and beanie for work. Snow has fallen on the mountains, and we’ve had some cold and wet days where I just wanted to curl up with cocoa and a book. If only we had a fireplace… hehe. The temps have gotten cool enough to where I have wanted to turn the heater on! But instead, I bake and the heat from the oven warms the apartment. This bread was made on one such day and I actually had to turn the oven on really low to create a warm enough place for the dough to rise. 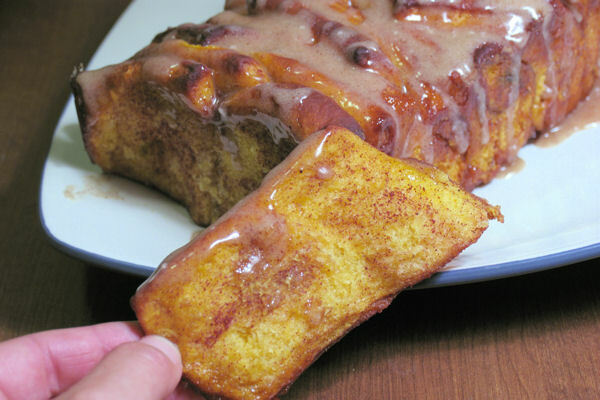 I’m sure a lot of you have seen the Cinnamon Sugar Pull-Apart Bread that spread around the blogosphere a while back. 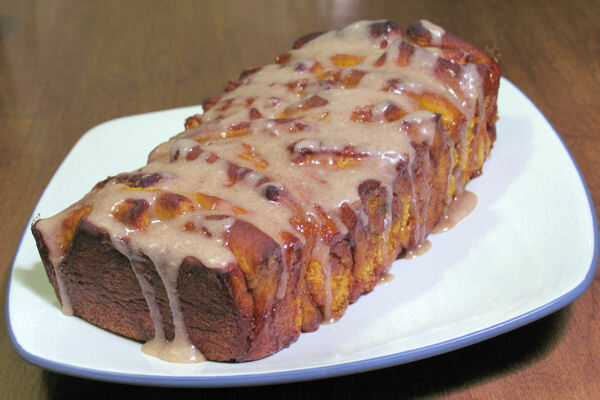 This is a delicious pumpkin adaptation I found while browsing for more pumpkin recipes. The bread had always looked like a lot of effort to me, and so I had passed on it. Besides, yeast still kind of worries me… and it requires so much waiting and planning… But when I saw this pumpkin version, I knew I had to try it. And man, was it worth it! 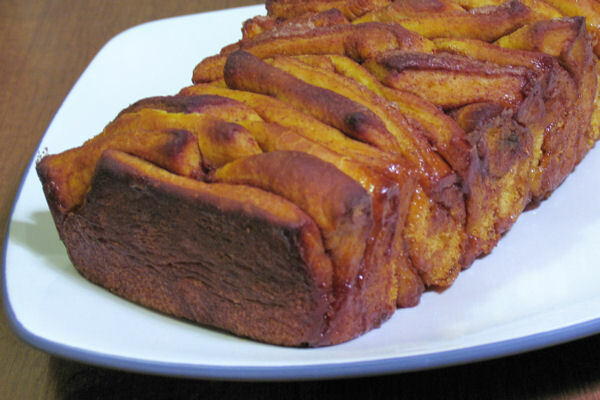 A fluffy, light pumpkin flavor with the cinnamon sugar combo reminiscent of cinnamon rolls, and a deliciously spiced glaze that compliments the bread perfectly! Get in the spirit of the season, and give this bread a try! Note: Dough can be left in the refrigerator overnight after the first rise, but pull the dough out of the refrigerator to let it rest for 30 minutes at room temperature before rolling it out. To make the bread: In a saucepan over medium-high heat, brown 2 tablespoons of butter, letting it bubble up and turn a dark golden brown but be sure to remove it from the heat before it burns and turns black. Once browned, pour the butter into the bowl of a standing mixer fitted with the dough hook. Pour the milk into the same saucepan and warm it thoroughly. Add it to the butter in the mixing bowl; allow the mixture to cool to about 100-110 degrees F then stir in the sugar and yeast. Allow it to sit for a few minutes while the yeast activates and bubbles or foams up. Slowly mix in pumpkin, salt, and 1 cup of flour. Stir until combined then add the rest of the flour ½ cup at a time, stirring after each addition. Knead for 4 to 6 minutes, until the dough is smooth and elastic and just slightly sticky. If the dough is too moist, add extra flour 1 tablespoon at a time. Transfer the dough to a lightly oiled bowl and cover with a clean towel. Allow to rise in a warm place for about an hour, or until doubled in size. To make the filling: While the dough is rising, in a small bowl combine the sugar, cinnamon, and nutmeg and mix well. When the dough is almost doubled in size, melt the butter and set aside to cool. Grease and flour a 9×5-inch loaf pan; set aside. To assemble: When the dough has doubled in size, punch it down and flip out onto a clean floured surface and knead with hands for 1 to 2 minutes. Roll dough into a 20 by 12-inch rectangle. Periodically check to make sure the dough isn’t sticking. If the dough seems difficult to roll out and is too elastic, cover it with a damp towel and let it rest for 5 minutes. Using a pastry brush, spread the melted butter over the surface of the dough then evenly sprinkle the cinnamon sugar mixture and press into dough with palms of the hand. With the long edge of the dough towards you, cut the rectangle into 6 vertical strips using a pizza cutter or a bench scraper. Lay strips on top of each other and cut each strip into 6 even squares. Stack strips vertically into the loaf pan. Cover the pan with a clean towel and let rise for 30 to 45 minutes. While the dough rises, preheat the oven to 350 degrees F for metal pans, or 325 degrees F for glass pans. Once the dough has risen, bake for 30 to 40 minutes or until the top is a very deep golden brown (it is important to not pull it out at light golden brown, or the bread may be raw in the center). Let cool for 20 to 30 minutes on a wire cooling rack. Once cooled, use a butter knife to loosen all sides of the bread from the loaf pan and gently turn it out onto a plate. Place another plate on top and flip it to turn it right side up. To make the glaze: In a small bowl, combine the powdered sugar, brown sugar, cinnamon, nutmeg, and cloves. Stir in the butter, then add 1 tablespoon of milk. Add up to 1 more tablespoon of milk until desired consistency is reached. Drizzle glaze over the top of the bread. Your pull-apart came out just gorgeous! Glad you enjoyed it! What a wonderful version of the Pull-Apart Cinnamon bread (I have even made it once, but very simplified, since I’m a very lazy baker). I am also scared of the yeast, but until now every yeast cake has worked quite well. I suppose it takes a lot of cakes to get rid completely of this fear. Seeing your beautiful cake I am thinking I’m probably the only one who hasn’t yet made anything with pumpkin or squash this year! This looks delicious. I’d be afraid I’d eat the whole thing because the pull-apart factor is so fun! I have NOT seen this recipe before so I am dying here. I am a pumpkin FREAK as you know and this looks almost too good to be true! Just breath taking my friend. I’m all about Pumpkin from now through November!! This is a fun and yummy treat! You can bet I will be making this very soon!! Your kitchen must have smelled amazing! Oh wow, it’s like a giant cinnamon swirl 😀 What a fun variation on the individual bun, and a great way of serving out little bites-worth. Loving the addition of pumpkin for the festive touch too – beautiful colour and, I’m sure, taste! I know I’ve said this before, but your cooking totally reminds me of my mom’s. (And that’s a good thing. 🙂 ) This bread reminds me a lot of her pull-apart cinnamon rolls. I like the idea of it in a loaf. My family would devour this in one sitting! A-mazing. Another great pumpkin recipe to try! Now I just need to get some pumpkin! I have been seeing pull apart breads all over pinterest lately… I need to make one! I could go for this…like…right now…looks delish.